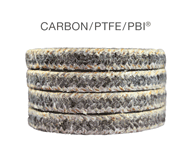 Teflon® impregnated, high strength carbon filament yarn with polybenzimi-dazole (PBI®) reinforcing braid/anti-extrusion corners. Non-abrasive: save on shaft sleeves. Non-contaminating: will not degrade product. High strength: extrusion resistant, lower wear, longer life. High heat conductivity: lower friction, longer life. Broad chemical compatibility: save on inventory costs, use one style for all applications. Extreme chemical service such as pumps handling Caustic – White / Black & Green liquor. Higher pressure capability than carbon and Teflon® based packings. Pulp & Paper Industry – Digester related equipment, Steaming vessel, Top Separator, bottom outlet, HP feeder, LP feeder. Slurry applications that require extrusion resistant packing, e.g. worn equipment.